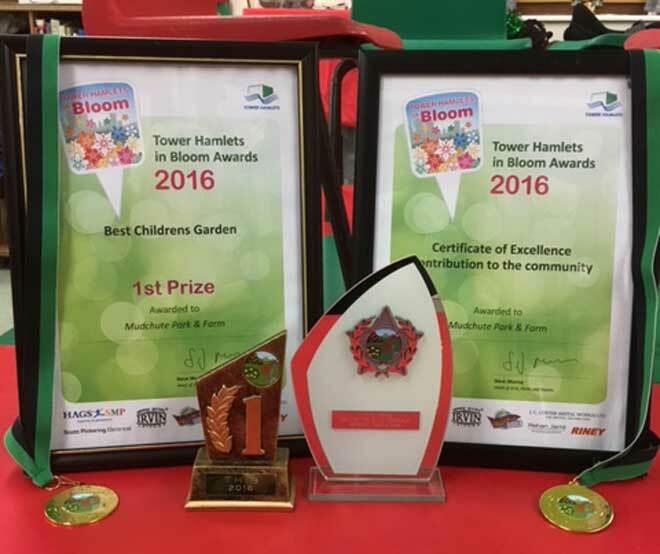 We are thrilled to be the recipients of the Best Childrens Garden prize and a Certificate for Excellence in Contribution to the Community in the 2016 Tower Hamlets in Bloom competition. Well done to all of our green fingered children and young people including students from Cubitt Town School, George Greens School, The Phoenix School, St. Paul’s Way Trust and Blue Gate Fields, as well as Stephen and his support worker, for his care and attention to keep everything watered. Our children’s/young people growing project is an educational tool here on the farm, covering cross curricula topics. Students take part 40 weeks of the year. All the above are able to harvest and cook their produce, including making green tomato salsa. Nothing goes to waste! Tower Hamlets in Bloom has recognised the dedication and hard work by all of the participating groups and the Mudchute education staff team. We hope you’ll join us in congratulating all the participants!